Precious with the song "Say It Again" polled over 52,000 votes to take them through to this years Eurovision Song Contest to be held in Israel. There were over 200,000 callers, the highest poll for the Great british Song Contest. The voting was very close ..
Scott English, co-writer of last year's Eurovision runner-up Where Are You Now?, is again challenging to win the song contest for the UK. Wait Until The Morning - which he penned with Matteo Saggese and Debbie French - has been shortlisted for this year's Great British Song Contest, although at present no artist has been announced to perform the song. Last year Imaani's performace of English's entry lost the competition by 7 points to the Israeli song Diva, performed by Dana International. Songwriters Mike Connaris and Paul Brown have also made it through again to the final eight and for the second successive year are paired with 17 year old singer Alberta, whose track So Strange will be released by RCA. The draw for the 1999 Eurovision Song Contest was held on the 17th November. Appearing at the OGAE UK Convention in Manchester 9-11th October Linda announced that she had recorded 19 tracks for a forthcoming album for Polydor which would consist of 14 of these tracks. The album is due for release in Ireland before Christmas with a UK release of possibly January. Sporting her new look Linda said she wished she could have her long hair back! See the Record Reviews page for info. Click here to download the 1999 Rules for the Eurovision Song Contest. This is posted on here as the EBU web site is difficult to access for this particular file. The file is in Adobe Acrobat v3 format. Only available by mail order this CD includes the original French, English & German versions of her Eurovision winner "Si La Vie Est Cadeau" plus 17 other great tracks. Available directly from Corinne herself at a price of 150 French Francs including postage. A new compilation cd out on the 5/10/98 in the UK called "Wicked Women (for breakthrough breast cancer)" contains THREE ESC stars. Gina G, Imaani AND Edyta Gorniak all perform tracks on the album. Exactly what tracks I do not know at this time. The catalogue numbers are; CD - EDFCD666 and MC - EDFMC666, available through Pinnacle Records. Dana International will be recording her version of "A Woman In Love" for an upcoming tribute to the Bee Gees. The members of the group have invited Dana to London to record the song, first made popular by Barbara Streisand. The album is due to be released in the winter, but even before that Dana will team up with the Bee Gees. Dana will perform with the group at a concert in Wembley Stadium in September. Dana's career is really on the fast track, and there may be a role in Hollywood for her as well. Elliot Castner, a well-known producer, has proposed to Dana that she take the lead female role in an upcoming romantic comedy. Issue 63 of Eurosong News (our sister publication) is out now! There is a slight problem on page 38 of issue 63 concerning orders for Vision 32. The address should read "15 Hammonds Lane". The date of the Eurovision Song Contest in 1999 is set for the 29th May 1999 and is to be held in the ICC (Binyaney Haooma,79's venue),Jerusalem. The list of the 23 participating countries will be available at the end of August. WANT A PIECE OF ESC 1998? Birmingham City Council have asked OGAE UK to let as many fans of Eurovision know that the street banners/flags that were so bright and colourful flying around Birmingham are up for sale! The Council would like as many to go to fans as possible. Street sized banners are also available but no price at this moment in time (ring the Council for details). The monies raised from the sale will go towards banners for the forthcoming disabled games to be held in Birmingham later in the year. There are about 200 banners, so there is plenty to go around! Write to: Birmingham City Council, FAO: Pippa Richards, Public Relations Division, Council House, Victoria Street, Birmingham. B1 1BB. This was the headline in the Mirror (the Sun had a similar headline) 30/6/98. "Eurovision fan Allan Todd's treasured collection of song contest discs has been stolen by a burglar. Allan, 37, spent over 30 years collecting the 400 records and CDs. He had every winner since the contest started in 1958. But the computer operator also hoarded tunes that weren't even good enough for Eurovision. His �5,000 collection included all the 21 songs Croatia has produced for its national finals. Allan said: "I'm sure whoever took them is the most disappointed burglar in Britain." The dad of two bought his first Euro song, Sandy Shaw's Puppet on a String, when he was six. He wrote to shops, TV stations and fans across Europe to get records. Allan even used holidays to go abroad to buy discs. His favorite was the 1972 Luxembourg entry, Apres Toi, which reached number two in the UK charts as Come What May sung by Vicky Leandros. Allan's all-time worst was a Turkish song Opera, by Cetin Alp in 1987. "It was dreadful", he said. Allan even named his daughters Romana, five, and Alexia, four, and his three cats and 14 fish after song contest singers. He said, "I desperately want the records back but I'm not hopeful. They might take one listen and throw them away." DIVA HITS THE UK CHARTS! Dana International and "Diva" entered the UK Top 40 this week at number 11. This is the highest placed non UK Eurovision record to enter the UK Top 40 since Johnny Logan in 1987. DIVA is released on 15th June 1998 according to SONY. There will be TWO CD singles (catalogue numbers DANA 1CD and DANA 1CDX) plus a cassette single (DANA 1MC). I have been told that HMV stores up and down the country are being inundated with requests for the CD - so let's hope that people keep their word and go out and buy it. It's been a long time since a Eurovision winner hit the number one spot, so let's do it in 1998! The CD is available in Ireland from the 8th June. DANA 1CD contains; English/Hebrew Radio versions, Handbaggers Remix, G's Heavenly Vocal & Dub. DANA 1CDX contains; English Radio version, Sleaze Sisters Euro Anthem, Paradise Revisited 7"/12"/instrumental mixes. You can now access the OGAE UK web site by using a new web address: http://come.to/ogaeuk This address re-directs you to our proper address but ofcourse is shorter and easier to remember. EuroSong News can also be accessed quicker by using: http://come.to/eurosong. If these new addresses fail (due to the redirection server being down) you can still access these web sites using their usual addresses. Yes OGAE UK does it again! There was Hale & Pace ... now how would you like to see Dana International? She will be appearing on the National Lottery show this Saturday. If you would like to be there call Robert Dean at the BBC on 0181-225-6114 as soon as possible. Tickets are limited and ONLY open to OGAE members. I've been informed by the BBC Eurovision webmaster Jon that the web site will no longer be maintained from this week. Dana International won the ESC 1998 on the final country when FYROM didn't award any points to Malta. The Spanish votes were amended 10/5 due to an error in translating the televotes into points. Germany received 3000 televotes and should have been awarded 12 points but were not given any points as Spanish TV thought that Guildo only received 300 calls. See the ESC 1998 link for an upto date scoreboard. The top 6 are unaffected. 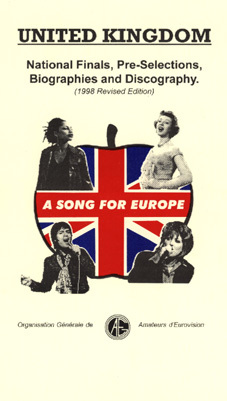 HISTORY OF "A SONG FOR EUROPE"
If you are going to Birmingham look out for a book on the history of "A Song for Europe". Revised and updated with biographys and pictures of the winners from each year this book is a valuable addition to any fans collection. Produced by OGAE and EuroSong News it will be on sale at the fan club information stand from Bank Holiday Monday.